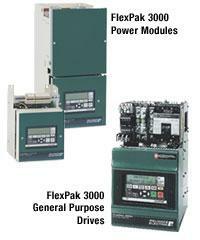 Reliance Electric Rockwell FlexPak 3000 50HP Drive. Does the operator interface unit indicate when the 50FR4042 has faulted? Yes, the 50FR4042's operator interface unit does indicate when the drive has faulted. When the 50FR4042's motor is in overspeed the operator interface unit displays "overspeed". What languages does the 50FR4042's operator interface unit display? The 50FR4042's operator interface unit displays six different languages which are english, spanish, italian, french, german, and alphanumeric code. Can AX Control repair my 50FR4042? AX Control technicians are able to complete board level repairs on a variety of devices including the 50FR4042. Once all repairs are complete we will preform a fully function test on your device to make sure all issues are solved. Can the 50FR4042 be converted to a 230 VAC drive? Yes, the 50FR4042 can be converted from a 460 VAC drive to a 230 VAC drive using the FlexPak 3000 voltage modification kit.